Since the 1990s, a growing share of the country’s Latino population has lived in fast-growing Latino counties. These are counties that have Latino population growth rates that exceed the national county median growth rate for the Latino population (about 27% from 2007 to 2014, for example) and have at least 1,000 Hispanics in 2014. 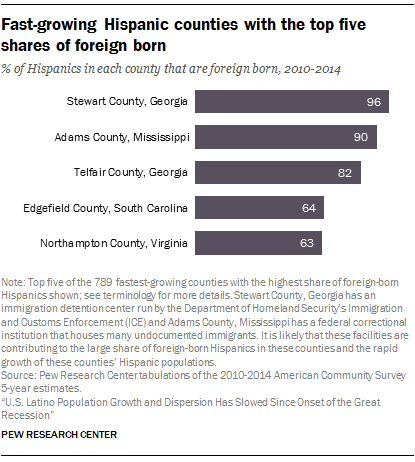 Overall, these counties have several characteristics in common – most are in the South, are part of metropolitan areas and have largely U.S.-born Latino populations. This chapter explores the trends and characteristics of fast-growing and slow-growing Latino counties. The 10 fastest-growing county Hispanic populations since the onset of the Great Recession (among those that had at least 1,000 Hispanics in 2014) are dispersed across the country and include Luzerne County in Pennsylvania, Beadle County in South Dakota and Duchesne County in Utah. Only three counties in the top 10 were in Southern states. Though counties in the South no longer dominate the list of the top 10 fast-growing Latino county populations, more than half (54%) of fast-growing counties by Latino population are in the South. From 2007 to 2014, fast-growing counties in the South accounted for the majority (64%) of the Latino growth in fast-growing counties. Northeastern fast-growing Latino counties accounted for 14%, Western fast-growing Latino counties accounted for 12% and Midwestern fast-growing counties accounted for 10% of this growth. 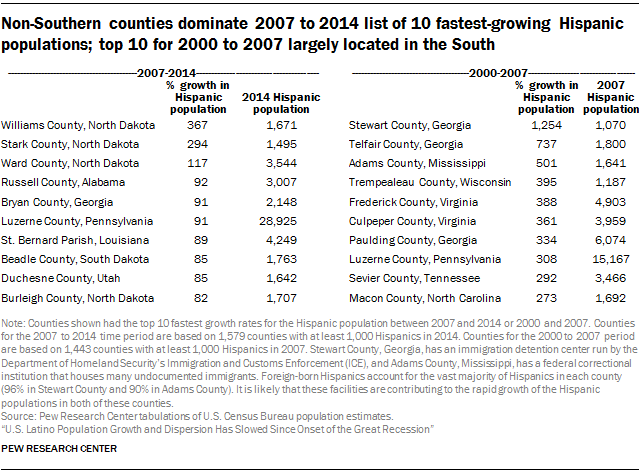 How many fast-growing Hispanic counties since 2007? There were 789 counties where the growth rate of Hispanics exceeded the national county median growth rate between 2007 and 2014 and had at least 1,000 Hispanics in 2014. Together they make up about 50% of all counties with at least 1,000 Hispanics in 2014. These fast-growing counties are smaller in their Hispanic populations than other counties with at least 1,000 Hispanics. In 2014, the average Hispanic population size of the 789 fast-growing Hispanic counties was 17,000. By contrast, the average Hispanic population among all counties with at least 1,000 Hispanics in 2014 was much larger – 35,000. Looked at another way, there were only 230 fast-growing counties with at least 10,000 Hispanics or more in 2014, making up 29% of the fast-growing Hispanic counties. And despite their above-average growth rates, these 789 fast-growing Hispanic counties accounted for a little more than a third (37%) of all U.S. Hispanic population growth between 2007 and 2014. 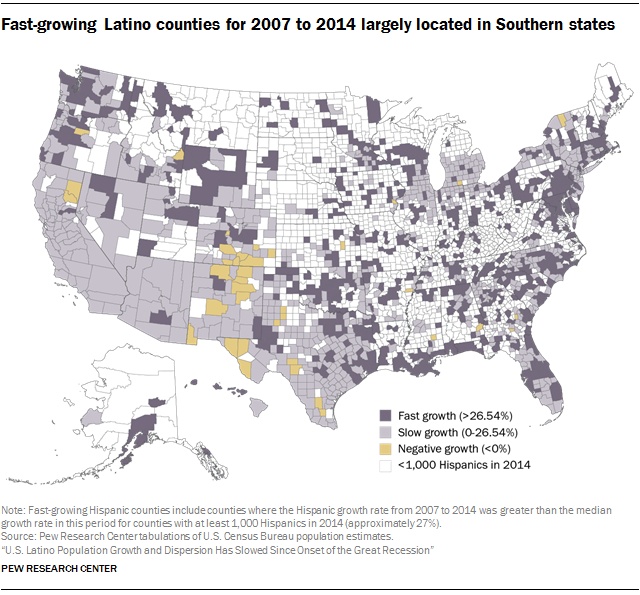 These fast-growing counties were home to a rising share of the nation’s Hispanic population in 2014, exemplifying the group’s growth and dispersion. That year, about a quarter (24%) of the nation’s Hispanics lived in these fast-growing counties – nearly twice the 13% of Hispanics who lived in these same fast-growing counties in 1990. 9 In 2000, 17% of the nation’s Hispanic population lived in these fast-growing counties, and 21% lived in these counties by 2007. 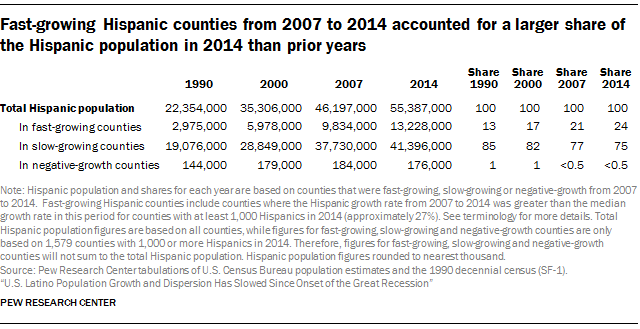 Still, most Hispanics lived in slow-growing counties – though this share has declined over time. In 2014, three-quarters of the Hispanic population lived in counties with at least 1,000 Hispanics and where their population growth was under the median Hispanic population growth rate – down from 77% in 2007, 82% in 2000 and 85% in 1990. The fast-growing Hispanic counties between 2007 and 2014 were largely counties in metropolitan areas. Metropolitan fast-growing counties with at least 1,000 Hispanics in 2014 accounted for 94% of the growth that occurred in fast-growing Hispanic counties, compared with 6% for non-metropolitan fast-growing counties. Likewise, between 2000 and 2007, metropolitan fast-growing Hispanic counties accounted for 94% of the growth in fast-growing counties. More than half (54%) of the fast-growing Hispanic counties from 2007 to 2014 were located in the South (426 counties); 24% were located in the Midwest; and 11% each were located in the West and Northeast. In the seven years prior, the South made up 60% of fast-growing counties, the Midwest made up 22%, the West made up 10% and the Northeast made up 8%. Many of the fast-growing counties by Hispanic population have more U.S.-born Hispanics than foreign-born Hispanics. And in 21% of these counties U.S.-born Hispanics outnumbered the foreign born by about 4 to 1 or more. Nationally, 34.9% of all Hispanics are immigrants. On average, about four-in-ten Hispanics (39%) ages 5 and older living in fast-growing counties speak only English at home. This is more than 10 percentage points higher than the 26.5% of all Hispanics ages 5 and older who speak only English at home. What’s more, on average, 72% of Hispanics in fast-growing counties are English proficient – meaning they speak only English at home or speak a non-English language at home but say they speak English very well. This is above the national average for Hispanics – 68% of all Hispanics ages 5 and older are proficient in English. Fast-growing Hispanic counties with larger shares of English-proficient Hispanics also tend to have larger shares of U.S.-born Hispanics. For example, 99% of Hispanics in Flathead County, Montana, are English proficient – the highest share among all fast-growing Hispanic counties – and 89% of Hispanics in this county are U.S.-born. 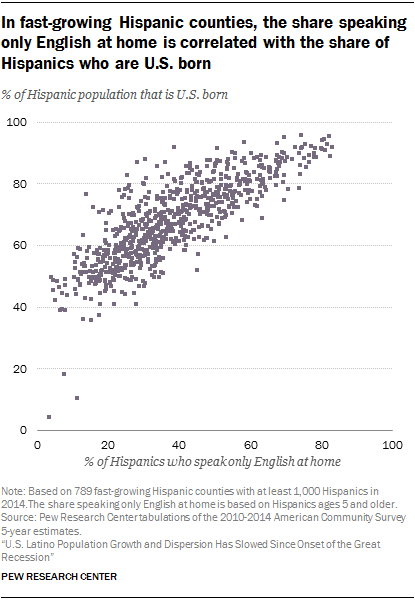 Among the 789 fast-growing Hispanics counties between 2007 and 2014, a majority of Hispanics ages 5 and older in 113 of these counties (14%) speak only English at home. Most of these counties were located in states in the Midwest (43) and the West (36). There were 18 such counties in the South and 16 counties in the Northeast. Kootenai County, Idaho, tops the list for the share of Hispanics ages 5 and older who speak only English at home (83%). 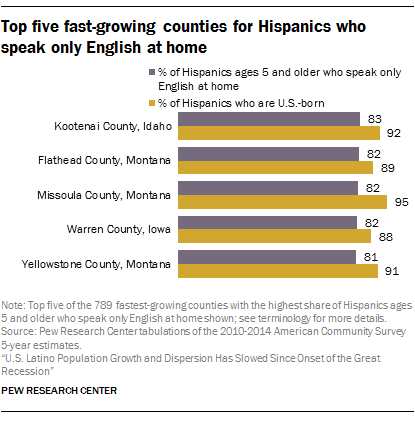 Flathead County, Montana (82%); Missoula County, Montana (82%); Warren County, Iowa (82%); and Yellowstone County, Montana (81%) round out the list for the top five fast-growing Hispanic counties with the largest share of Hispanics ages 5 and older who speak only English at home. The Hispanic population is not growing in every county of the country. In 2014, there were 38 counties with at least 1,000 Hispanics that saw their Hispanic populations decline between 2007 and 2014. These counties were mainly non-metropolitan ones, with the exception of Crosby County and Lynn County, Texas, in the Lubbock metropolitan area, and Hudspeth County, Texas, in the El Paso metropolitan area. Half of these counties were located in Western states, including Colorado (8), New Mexico (7), California (2), Idaho (1) and Oregon (1). There were 10 counties with declining Hispanic population in Texas alone (Texas is classified as a Southern state). Among these 38 counties for Hispanic population decline from 2007 to 2014, 19 had also experienced Hispanic population decline from 2000 to 2007. (See Appendix C for a table listing these counties.) 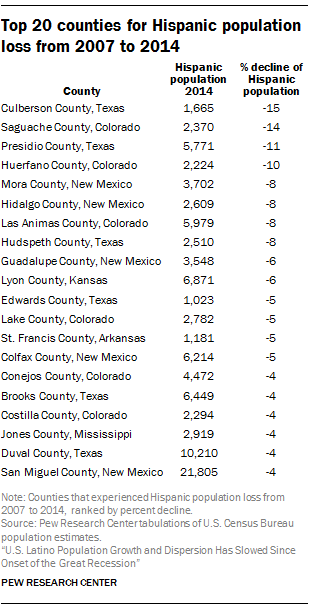 These counties were mainly located in Colorado, New Mexico and Texas and were mostly in non-metropolitan areas. The Hispanic population in 12 of these counties accounted for more than half of the county’s general population in 2014. Overall, between 2000 and 2007, there were a total of 46 counties where the Hispanic population declined (among counties with at least 1,000 Hispanics in 2007). More than a third (37%, or 17 counties) were located in Texas. There were also 11 in New Mexico and seven in Colorado. The other counties were in New York (three); Kansas, Louisiana and Virginia (two each); and Arkansas and Georgia (one each).